Our product development team likes to remind each other that we are in a fashion industry. We need to make sure we are on trend, or slightly ahead of the trend, to ensure the buyers have something fresh and exciting to work with. At Birchwood, we research the upcoming trends in upholstery, and work with our fabric suppliers to provide beautiful, rich fabrics at a price that will be competitive in the retail market. For 2018, the buzz word was texture. Multiple textures, such as velvet and leather toss pillows on a boucle sofa. The new plain fabrics selected for Spring 2018 were chosen to intermix with each other, as well as the existing fabrics in the Birchwood fabric line. Blue continues to be a strong performing colour. There were several new introductions for 2018 to add to our offering in this colour. The notable patterns in this range include Geode Lapis, a fun pillow/chair pattern; Grayson Midnight, a heavy boucle with an interesting mix of yarn colours; and Royale Eclipse, a rich ink-coloured velvet. 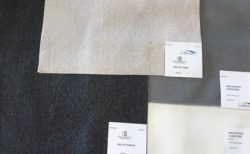 Livable, cleanable fabric is also an important portion of the market. It’s important to be able to offer similar fabrics in our line. Following the success of Peyton, Sugarshack, and Romero, we have added Tweetie Linen and Tweetie Pewter. These two new LiveSmart fabrics are stain resistant and water repellant. This makes white fabric a possibility for families and pet owners. It’s exciting to be able to select from hundreds of fabrics to find the perfect ones for our upholstery line. We’re already working on our new introductions for fall/winter 2018, and can’t wait to share them with you!